"Bad Time: According to this, there's a single, correct timeline, one that needs to be enforced by some sort of temporal police. How can you tell which is the correct time? Well, of course, it's the one where someone formed a temporal police force." Time Travel can cause a lot of damage. You could run into the Butterfly of Doom, leave behind a Timeline-Altering MacGuffin, try and bump off Hitler or create a Temporal Paradox. Therefore, in any society where Time Machines are easily accessible, deliberately altering time will be a crime. In addition, there may be people, most likely a police force or The Men in Black, who fight those who violate the sanctity of time. The existence of Time Police is implicit in "time travel is illegal" scenarios — if they didn't exist in some form, it wouldn't be illegal. And if the illegality is anything more than a throw away line, people are going to worry about being found by the Time Police. Of course, not all who police time are part of an official organization. In a setting where time travel is not easily accessible, there may be no laws to cover altering the timeline. Time Police in this case is any individual or group that takes it upon themselves to make sure that time plays out the way it's "supposed" to (although this brings up the question of whether their idea of how history should go is correct. What's to say Hitler ''should'' have won World War II, and a time traveler has altered it?) and keeps the timestream free of paradoxes. They may or may not be supernatural in origin, in this case. Although Time Police are usually intended to be Lawful Neutral, with their only obligation being to keeping time clean, so to speak, they will often fight on the side of good anyway. Somebody ought to check the screening process. Although there's an increasing deconstructive trend to make them Knights Templar willing to do anything to preserve the timeline they want. Sometimes they might serve as a Weirdness Search and Rescue (although the latter characterisation might still be applied, with the one who helps the protagonists being the equivalent of a Cowboy Cop). Oddly, if they're introduced in a long-running science fiction franchise, the question of where (when?) they were all the other dozens of times that time got messed up is barely handwaved if mentioned at all. If there is no such group in a setting it may come down to the heroes to take care of the same. This can prove to be difficult. 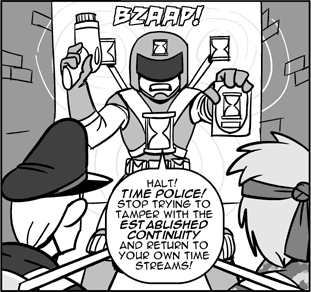 Time Police are very common in a world with Casual Time Travel. Sister trope to Clock Roaches. While the Time Police are people, and therefore fallible and have agendas, who happen to use Time Travel technology to do what they see as their duty, Clock Roaches are animals, often non-sentient, who are inherently able to attack time travelers. In contrast to Time Police, they also happen to be Nigh Invulnerable, Eldritch Abominations, and/or Have Reserves. Either way, though, they both serve the same purpose as tropes: to provide an unambiguous in-universe reason why trying to change the past is a very bad idea. Doraemon: the Time Patrol often acts as The Cavalry in nearly every movie, since Doraemon and the gang have the unfortunate tendency to run into time-travelling villains. Flint the Time Detective: the main characters work for the Bureau of Time and Space, and were tasked with collecting all the Time Shifters who were scattered across time, despite being a couple of kids and an unfossilized caveman. This usually lead them to a famous historical setting where they would square off against renowned time thief Petrafina, who was collecting the time shifters for her own purposes. Sailor Pluto from Sailor Moon is the guardian of the Time-Space Door and attempts to prevent and regulate time travel and people altering the time line. It's not explicit how she got this job, though Queen Serenity gave it to her at a young age. In her case, her powers over time extend to even freezing it around her, but she herself is not exempt from these rules. In the manga, she actually dies after using this ability, which she describes as a punishment for using it. In the anime, it's pretty strongly implied that she does die in the anime as well, and her later appearance is actually an earlier point of time from her perspective. Wibbly wobbly, timey-wimey. In fanfiction, she tends to either abandon this role willy-nilly to ensure that the writer's time travel plot will work, or enforce it through extreme prejudice far beyond what she is ever portrayed as capable of. Particularly extreme fanfics portray her as a Machiavellian extremist that violently engineers the Crystal Tokyo timeline the series works on. Time Patrol Tai Otasukeman, the fourth installment in Tatsunoko Production's Time Bokan series. Both the two main characters and the villainous Terrible Trio work for the Time Patrol, whose job is to prevent alterations of history. Both the trio (which later becomes a Terrible Quartet) and the good guys have secret identities, the former as the Ojamaman, who try to alter history following the whims of a crazy guy in a green cloak who is nothing more than an AI created by their new fourth member, the real main bad guy, and the latter as the titular Otasukeman, who always manage to put everything back in place, so that we never see the Time Patrol actually do anything. Of course nobody ever discovers each other's secret identities until the very end. Vector Prime has this role in Transformers Cybertron and, by implication, the entirety of the Transformers multiverse. The Time Variance Authority, which ties up all the loose ends inherent in every single instance of time travel, and prosecutes the guilty parties. Immortus, Lord of Limbo, considers himself a one-man time police force in Avengers Forever — his objective is controlling the Avengers in every possible timeline to prevent the human race from destruction by the Time Keepers. This extends as far as using the Forever Crystal to erase timelines which he feels are a lost cause. Interestingly, the TVA hates the Avengers, as they're the single biggest perpetrators of time travel paradoxes. Seriously, a team with two Hank Pyms from different eras? Disney Comics have their own Time Police, though most time-travel stories don't even mention them. In one particular story, the trope was amusingly messed with as Scrooge gets a time-machine and is fined by two Time Agents who turn out to be nothing more than a duo of imaginative crooks. Except this only sets up for Scrooge to hen ignore the warnings of the real Time Police people when they show up. In the more "serious" sci-fi sort-of-alternate-continuity of the Paperinik New Adventures title, the Time Police are greatly expanded upon. There, it is revealed that they get around the many possible time-travel loopholes by building their HQ outside time itself: whoever is in the HQ isn't affected by any changes to the timeline, and can thus work to restore it. The series also shows the darker aspect of this trope: the issue "The Day of the Cold Sun" has our hero forced to ally with the time pirate the Raider to prevent the destruction of Duckburg due an experiment on cold fusion going horribly wrong and nuking the city. And when the explosion doesn't happen at the allotted time the Time Police agents show up to cause it themselves!. At least, until their fight with Paperinik and the Raider's plan backfiring on him cause so much trouble that making the experiment fail in a non-explosive way is the better option. Hunter and Waverider were both members of the Linear Men at one, er, time. It's possible one of the many history-changing events they failed to do anything about has undone this. The Time Masters are the new Time Police after the Linear Men were locked away. The Post-Crisis version of Rip Hunter founded and leads the group. Unlike the Linear Men, the Time Masters are more concerned with protecting the timeline from malicious time travellers. The Time Police in Jughead's Time Police. They were equipped with cool future technology. The Temps Aeternalis in The Umbrella Academy. It seems like their main function is to carry out assassinations, or as they call them, "corrections". Their purpose is to maintain the status quo. Valérian is about the adventures across time and space of a member of the Time Police. One issue of Spirou and Fantasio ends up with the main characters being rescued by Time Police after they end up helping the first time traveler and become stuck in the past when his prototype breaks down. The Time Police state that he would need to be returned to his own time to continue his research, and imply that rescuing him is them performing their duty in a Stable Time Loop. The short-lived Bill & Ted's Excellent Comic Book featured Time Thumb and the Chronological Order, who played this role against the titular heroes. This short comic, written by Alan Moore and illustrated by Dave Gibbons (before they collaborated on you know what). Judge Dredd: In the stories "Dead Zone" and "Breaking Bud", time travellers from the 28th century are revealed to visit 22nd century Mega City One. The time agents get involved when one of their futuristic wristband devices goes missing and turns up again in the hands of a fugitive from the Cursed Earth. Netraptor's series of Sonic the Hedgehog fanfiction includes the Time Rippers, an ancient civilization of time travelers. Angel-Black Sweet's C.I.A. series of Sonic the Hedgehog fanfiction has the agents becoming the only legal beings that can do the Time Travel. The Dear Sweetie Belle Continuity has the Guild of Time Defense, founded by multiple versions of the inventor of the time travel spell, who subsequently passed their essence into countless ponies across the space-time continuum, signified by an hourglass cutie mark. Cassie in Frequently Asked Questions About Time Travel belongs to one of these organizations. Subverted in Meet the Robinsons. Lewis is reluctant to believe that Wilbur is a time traveler working for the "Time Continuum Task Force," especially when he notices that his "badge" is a coupon for a tanning salon. He's then surprised to learn that, while the police angle was a lie, Wilbur really does have a Time Machine and comes from a few decades in the future. The secret time travel agency in Predestination. Its purpose to prevent crimes before they can happen. Or as Robertson puts it, the agency is "reshaping wrongdoings". Timecop is probably the Trope Codifier. Jean-Claude Van Damme is part of an agency who travel to the past to heroically prevent time travel from being abused! The Time Patrol from a series of Poul Anderson's stories. Anderson doesn't shy away from giving them some Knight Templar tendencies either: In "The Only Game in Town", preserving the timeline that led to the creation of the Time Patrol means two patrolmen must alter the timeline and kill a Chinese expedition which, without the patrolmen's interference, would have brought word of the Americas back to Kublai Kahn. Also the Time Patrol in A Tale of Time City by Diana Wynne Jones, although they play a very minor part in the story. Fredric Brown wrote three "The Short Happy Lives of Eustace Weaver" short stories about a man who invents a time machine and uses it to steal money from a bank with a time lock. In the first two, misunderstandings about the nature of time trip him up. In the third, Time Police arrive and execute him on the spot. The Chronoguard in Jasper Fforde's Thursday Next, which, unfortunately for the protagonists, is terminally corrupt—barring a few honest holdouts—Thursday's son later reforms the force, only to discover that it's use of time travelling technology have the effect of irrevocably destroying humanity's collective cognitive abilities, and wipes the entire thing from the timeline. When The Stainless Steel Rat suggests getting rid of a troublesome race of aliens by sending them forwards in time (to when the human race will be prepared for them) a member of the previously unknown Temporal Police materialises out of thin air and tells him it's forbidden. This situation is analogous to the previous suggestion of sending the fleet to a parallel universe, blocked by the newly-introduced Moral Corps, whose authority supersedes even Inskipp, the director of the Special Corps. Their reasoning (perfectly valid) is that they have no right to dump the problem on humans in another universe. Unfortunately, the massive power requirements for transporting an alien armada to another reality limits the choice to only several "nearby" universes, all but one of which contain human life. In the remaining universe, humans have long ago subjugated the aliens but do not desire any more of them. The Temporal agent does drop a hint on how to resolve the situation, however. The Time Commandos in Simon Hawke's Time Wars series. The Time Wardens in Tom Holt's Overtime. Agent of T.E.R.R.A. series of books by Larry Maddock. The History Monks used to be this, preventing anyone from messing around with history, and altogether "making sure tomorrow follows today correctly." And then the Glass Clock shattered, and their job changed to making sure tomorrow followed today at all. Lu-Tze: And on my kind of patrol I've found you, in a metaphorical sort of way, lying in the gutter signing a rude song about wheelbarrows. Vimes: I don't know any rude songs about wheelbarrows! The so-called 'Time Police' in Perry Rhodan's Magellan arc could be considered a mild subversion; rather than travel through time themselves, they just launched devastating attacks against any civilizations 'guilty' of using time machines in the present. Earth also once featured an (automated) alien installation that prevented time machines there from traveling back significantly beyond about 50,000 BC as part of a scheme to conceal said aliens' presence another one hundred and fifty thousand years earlier. Time Police agent Josie Bauer in the Callahan's Crosstime Saloon story "Have You Heard the One...". She collars the time criminal Al Phee, who's trying to change the past in a minor way to make a profit in the future. Josie revealed that she got the job from her father, a famous science-fiction writer and part-time Time Police agent. At the end of the story it's revealed that her father was in fact Philip José Farmer (she let it slip that he was writing a new Riverworld book). In the end, the Traveling Salesman was taken down by the Farmer's Daughter! In J. K. Rowling's Harry Potter and the Prisoner of Azkaban, Hermione mentions in passing that she and Harry are breaking wizard law by meddling with time. The Ministry doesn't appear to have any way to actually enforce this, however, and they seem to assume that Time-Turners simply won't fall into the wrong hands. The Ministry does keep them locked up in the Department of Mysteries. Rowling makes a point of having them all broken in book 5 so readers wouldn't assume time travel figures into the last two books. The Time Patrol from Robert Silverberg's Up the Line. In Christopher Stasheff's Warlock of Gramarye books, the inventor of the time machine sets up an informal time police organization (GRIPE) after his technology is stolen by people trying to change the timeline to defeat democracy. The Eschaton in Singularity Sky and Iron Sunrise by Charles Stross is an AI using atemporal logic; it can violate causality by informing itself in the past of the results of future computation and observation. One of the things this lets it do is to observe others violating causality by the results in the future, giving the data to its past self, which can then prevent the incident occurring in the first place. It uses human agents as a first line of defense, and godlike overkill as the last to keep human history (and its own creation) intact. The Time Purists in The Missing series basically "try to keep the timeline running correctly". "Wikihistory" , by Desmond Warzel, is told as a Web forum of the International Association of Time Travelers. Much mention of punishing rookies for killing Hitler occurs. David Drake and Janet Morris had the ARC, that fought wars across different timelines. The time cops of Time Scout are the BATF. Generally, they just keep people from profiteering from time travel and prevent looting of historical treasures. The protagonist of the Jack Chalker novel Downtiming The Night Side gets caught up in a full-scale battle over the timeline that turns out to be a second front of The War of Earthly Aggression. One side portrays themselves as time police and their opponents as terrorists. The other side doesn't bother with such niceties. A variant of your typical Time Police crops up in Roger Macbride Allen's The Depths of Time novel (and its sequels). Due to how faster-than-light travel works (ships fly slower than light to a wormhole, which sends them back in time to another wormhole), it's possible for ships to arrive at destinations before they departed, which would cause all sorts of problems with reality. The Time Patrol patrols the wormholes with battleships, destroying anything that attempts to get through without proper authorization. All ships have extremely paranoid computers installed in them, which will deactivate (or outright destroy) a ship if it thinks that it has wound up in the past. The Patrol can get news before it happens, which is locked away in vaults until the event actually happens. In a short story prequel to the Morgaine Cycle, it's revealed that the precursors had Time Police whose job was to make sure that their Cool Gates weren't used to make large changes to the past. They did this not to preserve some "true timeline", but because if the past was changed too much it would lead to a truly catastrophic Time Crash. The Time Police eventually fail at their job, and the resulting Time Crash wipes out the precursors' galaxy-spanning civilization. Ron Goulart's The Robot in the Closet and The Enormous Hourglass have a Time Travel Overseeing Commission. The Enormous Hourglass also has temporal Private Detective Sam Brimmer and his robot sidekick Tempo. While no actual Time Police show up during the Star Trek Expanded Universe novel Star Trek: Federation, the Temporal Prime Directive (see Live-Action TV, below) is in full force, requiring Kirk to have the viewscreen blurred to avoid a paradox when a Negative Space Wedgie causes them to meet the Enterprise-D. The titular organisation in the Star Trek: Department of Temporal Investigations novels also counts, though they don't have any reliable method of time travel, instead mainly filling out the paperwork created from temporal incidents. The other organisations mentioned below in Live Action also appear, few of which get along, partially because of differing methods, and partially because they're not entirely sure that they come from the same timeline. In Robert A. Heinlein's Future History series, after the invention of pan-universal time travel in The Number of the Beast, protagonist Lazarus Long and his allies grasp the horrific potential of a device that can transport anyone to anywhere, anywhen, in any reality, in the blink of an eye with zero power consumption. They form a Time Corps whose mandate it is to police the various timelines and fix any damage done by rogue time travelers, while at the same time identifying and recruiting likely agents from among those timelines. The plot of The Cat Who Walks Through Walls involves a running battle with exactly such a force; at stake is the "rescue" of an Artificial Intelligence capable of perfectly predicting the outcome of time manipulations. Stephen King's 11/22/63 has a guardian assigned to each time portal. Dialogue alludes to some kind of "training," hinting that they are part of a formal, organized Time Police. Unfortunately, the human mind is not well-suited to comprehending time travel paradoxes, so the more damage is done to the timeline, the more subject they are to Sanity Slippage and, thus, the less able they are to do their jobs. The Temporal Rectification Division in Chrono Hustle fulfils this function. In Relativity, when the time-traveller Phanthro first appears, he is mistaken for a time cop. Phanthro: Oh, heavens no. You think I'm one of those people who want to stop someone from altering the past so the future stays intact? Sorry, that's the stuff TV shows are made of. Time is fluid. It's changing all the time. It would be impossible for anyone to govern such a thing. In Cyril Kornbluth's short story "Time Bum", a con man tries to set up a sting by posing as a Time Policeman from the 25th century, and "accidentally" revealing himself as such to the mark. Unfortunately for him, the Time Police are real, and his would-be sting earns him the death penalty. The Aeon Legion from Aeon Legion: Labyrinth. They work with Sybil who use precognition to anticipate attempts to alter history and technology that gives them power over time for when time travelers resist their authority. The Legion tolerates time travel, they are just very picky about what time travelers can and can't do. TIME, the from the Choose Your Own Adventure Falcon, the "Temporal Investigative and Monitoring Executive." In Vasily Golovachev's Time of Troubles series, in addition to the eldritch Clock Roaches the Chronosurgeons, their brainwashed human minions, the "Orderlies", also exist. Like their masters, the Orderlies do not have any particular goals of protecting the timeline, but they are militarized and interfere with any civilizations attempting time travel (or becoming witnesses of time travel, as well). Bernard's Watch: The Postman makes sure the watch's owner doesn't use it to commit crimes. He also ensures that time loops don't occur (such as when Bernard's cousin Lucy kept trying to rewind the watch). The Janitor and the clone of Josie in Black Hole High. The clone was an agent from the future sent to ensure the safety of the timeline by having time travel technology develop in the right hands. The Janitor was from the further future and was a much more knowledgeable time policeman. The Cleaners in Charmed are an organisation dedicated to upholding The Masquerade, though, in carrying this objective out, they are capable of acting as Time Police Officers, by such means as turning back time and even erasing all trace of offenders from existence if they deem it necessary. Continuum: when it comes to enforcing the correct timeline, There Are No Police. There is, however, an intimidating cult of vigilante temporal enforcers known as Freelancers who act much more like a time Mafia than time police. The exact mission of the Time Lords was never made clear, but it's implied that they somehow kept watch on time travel, dealing with any paradoxes and stopping people abusing it. And stopping the Clock Roaches from eating planets. The Time Agency was initially thought to be humanity's Time Police. Between New Who and Torchwood, though, it's hinted to be a mix of this and opportunists. Kamen Rider Den-O has the main protagonists acting as a form of Time Police, protecting the timestream from the Imagin, whose goal is to change the future by rampaging in the past. The Hero Ryotaro occasionally tries to bend the rules to help the Victim of the Week with whatever problem they've got. The fifth/seventh movie (Episode Yellow of the Chō Den-O Trilogy) introduces an actual Time Cop, who arrests anyone who alters history, good or bad; naturally, he ends up becoming the movie's antagonist as aside from anything else, by this point Den-O himself is a walking changed timestream. The Time Masters. Rip Hunter is a renegade Time Master who wants to Set Right What Once Went Wrong, despite the fact the Time Masters say it was supposed to "go wrong". They eventually discover that the Time Masters have been manipulating all of history from the Vanishing Point, which gives them complete omniscience except regarding the Vanishing Point itself. They saw a Thanagarian invasion coming, and decided that Vandal Savage was the only one who could stop it, so they subtly altered history to bring him to power and unite the world under his rule. The Legends destroy the Vanishing Point, disband the Time Masters, and kill Savage long before he rises to power. In the second season, the Legends have taken over the Time Police duties... but they're kind of terrible at it. They work to fix "aberrations" caused by rogue time travelers, and while they do mostly fix things, they also make an embarrassing number of accidental changes to the timeline in the process. These include giving Albert Einstein's wife credit as a genius equal to her husband, loosing zombies on the Civil War, seducing the queen of France, and giving Mick a Revolutionary War statue. Rip eventually creates a new organization to replace the Time Masters. The Time Bureau agents are more professional and bureaucratic, and no fans of the Legends. (Eventually, that does include Rip himself. No one's above the law, so they arrest their own founder after he pulls some Legend-style rulebeaking.) By season 4, the Time Bureau and the Legends reach an understanding where the Time Bureau handles the routine policing of the time stream and the Legends are sent to deal with the really weird stuff like time traveling magical creatures. Lost's show runners have described Mrs. Hawking as a "temporal policeman" who prevents Desmond from changing the past during his initial visit to 1996. The Spanish show The Ministry of Time is about how the Spanish government regulates time travel. NTSF:SD:SUV::: The "Time Angels" who appear in two separate episodes to upstage the regular cast are a trio of beautiful female agents that spoof Charlie's Angels, except they patrol time. Their arch-enemy is Leonardo da Vinci, who invented time travel so that he could claim to be responsible for all other inventions as well. The Outer Limits (1995) had recurring character Nicholas Prentice, a senior agent of a future time travel agency. He and his colleagues ensure the regulation of time travel, but he is allowed to Set Right What Once Went Wrong himself (succeeding when he brings a Nazi war criminal to justice, but failing when he can't prevent a Presidential assassination). His agency recruits its agents by plucking people out of their timeline moments before they were set to die in fatal accidents. Not exactly time travel, but in Parallax the Guardians are charged with preventing pollution of the alternate realities. Though no actual time police feature in Phil of the Future, Lloyd tells Phil that new laws regarding time travel were passed due to their family's intervention and was named after them, so there are stronger restrictions on Casual Time Travel. What that meant for Phil was that when his family returned to the future, they would be legally prevented from returning to the past. Mirai Sentai Timeranger and their American counterparts Power Rangers Time Force. Though Time Force was originally just a non-time-traveling 30th century elite police force with a Time Machine Combining Mecha, a Time Ship, and a Humongous Mecha that forms and mans a Cool Gate for time travel. Ya know, just in case. Averted in both Power Rangers Turbo and Power Rangers S.P.D., for identical reasons: one character in each (the Blue Senturion and the Omega Ranger) is both a Space Police officer and a time traveler, but they're only trying to Set Right What Once Went Wrong after an alien invasion won; their normal cop duties have nothing to do with time travel. Averted in the various Stargate series, especially Stargate SG-1, but still worth mentioning because that setting really should have Time Police. Despite multiple methods of Time Travel in the setting, there are no people or Clock Roaches preventing paradox or enforcing a preferred timeline. Despite Precursors and Sufficiently Advanced Aliens who are totally willing to tell humanity You Are Not Ready on other issues like interstellar travel and certain weapons of war, they've never warned people away from screwing with history. Both good guys and bad guys do it. When people time travel and step on the Butterfly of Doom, the heroes have to make Heroic Sacrifices to Set Right What Once Went Wrong and still put up with a Close-Enough Timeline. The Temporal Prime Directive, enforced by a variety of time agents who seem to have no relation to each other (and should be constantly getting in each other's way.) Captain Kirk harried the time agents to no end. Voyager twice ran into Starfleet Time Police from the 29th century. Then there was the whole Temporal Cold War thing in Enterprise, where it was implied that Daniels' side was mostly there to keep history going as it should have done. Deep Space Nine had Temporal Investigations, which seems to be based in the present (theirs, that is, not the viewer's). The names of the two agents we saw were Dulmer and Lucsly. And also Gary Seven- and whomever he works for- from the TOS episode Assignment: Earth. He claims to be "from" the time period the episode is set in (1960s) but for the episode's purposes he's only there to stop a nuclear explosion. We probably would have found out more in the planned series, but it never came to be; nonetheless, he's been in the expanded universe a few times. Fate in the Supernatural episode "My Heart Will Go On". Timecop was a short-lived spin-off series based on the Van Damme Timecop movie. A new protagonist travels back in time Once per Episode to stop evil time travellers. The American show Timeless has three agents (a history professor, a scientist and a marine) doing esentially Time Cop work. The Guardians of Time in The Tomorrow People, presumably. The Guardians are a more advanced form of human than homo superior (called either homo novus or homo sapiens temporum), though it isn't exactly clear what their role is, as their appearances all involve them being lured into traps by villains seeking to exploit their ability to facilitate time travel. Voyagers! is an interesting concept, in that there's no actual evidence of meddling by anyone other than the Voyagers themselves. Their purpose is to make sure history went the way their records say it did. Is this a Stable Time Loop? All PCs in the time-travel RPG Continuum have this as one of their basic duties, although the Foxhorn Fraternity is the one specifically devoted to the task of rooting out Narcissists (time-criminals). Note that the RPG specifically mocks and derides the trope of the "Time Police" as a bureaucratic organization, and describes this as a misconception caused by our 20th-century prejudices. Keeping the timestream clean is everyone's responsibility in the Continuum. The Guardians of Forever in Genius: The Transgression. The Terminals filled the role before they were removed from the timeline. In something of a subversion, said Guardians are incredibly overworked, paranoid and looking for help, and also fractured and corrupt — many have gone renegade. At least the current timeline seems relatively stable... for now. The Infinity Patrol (and its elite division ISWAT) from the default GURPS setting is partially tasked with policing alternate timelines. Unlike most time cops they are far from neutral as their main objective is to protect the interests of Homeline. The Sidereals and other employees of the Bureau of Destiny in Exalted fill this role to some extent. Even if they exist in a universe where time travel is technically impossible, there is still a notoriously unstable Loom of Fate that has to be protected from disturbing elements (such as other Exalted or the creepy things living outside Creation). In Chrononauts, the Time Repair Agency functions as this. A player who has 10 cards in their hand (one of the three ways to win the game) is made a new Agent in-game due to their skill at fixing paradoxes. In the Yu-Gi-Oh! card game, there's this guy. He's just what his name implies. Warhammer 40,000, given that the only means of interstellar travel goes through essentially hell, and people have been known to reach their destinations before they left, has mentions of a subsection of the Inquisition devoted to this, the Ordo Chronos. Who all mysteriously disappeared at the same time. And who all may reappear somewhen. In Savage World's "TimeZero, the PCs play Time Police agents. To make a second verse, same as the first one, the PCs can also play Time Police agents in "Timewatch" for "GUMSHOES RPG". Dungeons & Dragons: This is the job of the Quaruts, one the types of Inevitables — living mechanical beings hailing from Mechanus, the plane of Law, whose purpose is to uphold the sanctity of law in the multiverse. Quaruts are one of the most powerful kinds, and they are specifically meant to prevent anyone from altering the past and, through that, risking causing irreparable damage to causality. Pathfinder: One of the types of outer dragons, a group of dragon species tied to wide-reaching cosmic concepts, is the time dragon. They see themselves as guardians of the integrity of time, and protect the universe against those who would interfere with the natural order of the timeline. In Achron it turns out that the reason that the Grekim are determined to wipe out humanity is because humans were about to discover Time Travel and the Grekim don't want anyone 'muddying' the time stream. What the laws are exactly is kind of vague in Where in Time is Carmen Sandiego?, but it's clear enough that it's illegal to steal historical artifacts from the past and the good characters are always concerned about history being disrupted. City of Heroes introduced the Menders of Ouroboros in a major update, who try to recruit the players into helping them fix the timeline to avoid a mysterious future cataclysm only referred to as "The Coming Storm". Blinx, big time. The game, which stars an anthropomorphic cat who works to repair time glitches in various dimensions, introduced the idea of the player controlling the flow of time to solve levels. You are the Time Police. The world's first time machine, the Pegasus Device, is safely in the hands of the Temporal Security Annex, an organization devoted to protecting the timeline from those who would change history for their own gain (presumably, they use it for historical research); naturally, the player — Gage Blackwood, TSA Agent 5 — ends up having to save history from a xenophobic madman trying to sabotage Earth's entry into The Federation. In the first game, the job of policing history is performed by allowing historical changes to happen, grabbing a backup disc containing unchanged history from 1 million BC, then cross-referencing with recorded history in the altered present. There are no safeguards if history is altered so that the TSA fails to be founded (but there are safeguards if the TSA is founded but elements in the altered timeline's incarnation would prefer it to remain in its new state. ), but fortunately an improved time machine is used from the second game onward that doesn't necessitate returning to the present before the next jump. The Bronze Dragonflight is pretty much this. In World of Warcraft, they enlist adventurers to help them battle the Infinite Dragonflight, implied to be Bronze Dragons corrupted by the Old Gods (who tried to manipulate time to free themselves in the novels), keeping the timeline intact. Notably, that corruption is a recent thing. As of The Burning Crusade it was implied that the Infinite Flight were rebelling Bronze Dragons rather than corrupted ones. Since the major theme for Wrath of the Lich King has been "Old Gods corrupt things", the Old Gods are behind it. Likely this will change at least twice more before it's actually given a concrete answer. Also notably, the leader of the Bronze Dragonflight and the leader of the Infinite Dragonflight appear to be the same person from different times. Time travel is confusing. Furthermore, he has always known that he will eventually become the other leader and that he will then be killed by players allied with his past self..
As of the end of Cataclysm, Nozdormu has lost his immortal powers. While the Bronze Dragonflight is still doing their job as Time Police, the trading card game has introduced a faction called the Lorewalkers. They seem to be mortals that are also stepping up to patrol history. Aeon from Castlevania: Judgment turns out to be one of these, although this isn't revealed until you reach Death's story. Even then, you only learn the details and meet the perpetrator once you unlock True Story mode. Saint Germain from Castlevania: Curse of Darkness too, of course, Epileptic Trees suspect they may be the same person. Phoenix from F-Zero comes to the 27th century from the 29th to stop a criminal from the future from mucking up time in the past. What this has to do with entering the F-Zero Grand Prix is never really looked into or explained; although he modified his machine to be on par with the "current" standards so as to not completely outclass the other racers, he makes it pretty obvious he's from the future. The role of the Time Diver in Super Robot Wars's Alpha continuity is Time and Space Police; the job is initially taken up by Ingram Plisken who is subsequently killed and tries to take over the body of Ayin Barshem, later known as Cobray Gordon. The latter's force of will allows him to resist the possession, and eventually the original Time Diver passes on his title and responsibilities before moving on. This is the purpose of the Sentinels of Hallifax in Lusternia. They spend most of their time cleaning up the messes of their fellow Hallifax guild the Institute. The Sequel Police from Space Quest IV are a villainous example, trying to hunt down and kill a time-traveling Roger on Vohaul's orders. Final Fantasy XIII-2 features this trope in one of its Paradox Endings. Magical Girl Lyrical Nanoha A's Portable : The Gears of Destiny has the Florian Sisters, who were tasked by their father to serve as the Guardians of Time, who will protect the Destined Fate. The plot begins when Amitie Florian goes after her sister Kyrie, who had gone rogue in a desperate attempt to find something in the past that could help her father achieve some progress in his planet restoration project before he dies. In the Ambitions expansion for The Sims 3, Sims using the Time Machine occasionally have narrow escapes from a mysterious "Keeper of Time." Everything only appears in flavor text, though, so there are no in-game implications. The Dahaka from Prince of Persia: Warrior Within pursues the Prince throughout the game because he was meant to die in the previous game. The Prince either has to prevent the Sands of Time from being created in the first place or kill the Dahaka itself to stop it from eternally chasing him. Dragon Ball Online introduced the concept of the Time Patrol, who work to prevent criminals from altering history; their primary opponents are Towa and Mira's Time Breakers. The concept would be expanded upon in Dragon Ball Xenoverse and Dragon Ball Heroes. Dusknoir of Pokémon Mystery Dungeon: Explorers traveled back in time to apprehend a dangerous outlaw and prevent him from stealing the Time Gears, which would cause a Bad Future. Except that he in truth wishes to preserve the bad future, and the "criminal" Grovyle is actually trying to fix things. Silver from Sonic the Hedgehog could be this, since his usual plot-important reasons to travel back in time is to eradicate anything that causes a Bad Future. The game features several different versions of this, as a consequence of the different natures of the temporal incidents. Some are directly from the show (the Department of Temporal Investigations, the 29th century Timefleet incarnation of Starfleet, Daniels' unnamed agency), one is an ad-hoc response (involving the player character and either a Section 31 or a Klingon Intelligence operative depending on alignment), two are counterpart agencies for other factions (the Klingons has Temporal Intelligence, the Romulan Republic has Romulan Temporal Defense) and one (the Temporal Defense Initiative) is a coalition of the temporal agencies of most major powers that will be formed in the 28th century. Ironically, the main contact with the current-time Time Police agencies occur as part of temporal meddling they themselves are responsible for. The Time and Tide episode gives a relatively reasonable answer to the question about the correct timeline in the page quote — it's the one (or the ones) in which the main time-travelling powers came to an agreement to work together to put major restrictions on the usage of time-travel. It's not so much appeal to force as appeal to stability (the correct timeline is one which isn't constantly being altered in major ways). In Sunless Skies, the Horological Office's official job is just to make sure that every clock in the Empire shows the same time (which is more important than it sounds when the laws of reality are slowly becoming mere suggestions and one of the cornerstone resources of the Empire is solidified, refined time, with both refinement and use of it affecting the surrounding area), but they occasionally lean towards being this. In Nuclear Throne we have the IDPD, the Inter Dimensional Police Department, who comes from a timeline where the apocalypse never happens and chase your character throughout the game for unknown reasons. If you manage to get far enough to reach a third loop, it's inferred that they chase you to prevent the apocalypse from affecting their dimension, and that now it's too late. Sans from Undertale never explicitly says he's one, but he may as well be. When you go full on No Mercy, he outright states that he's been keeping an eye on the multiple timelines, that he saw them eventually end... and he could no longer afford to stand on the sidelines, and fights you head-on to put a stop to it all. And he's by far the hardest boss in the game. Used in this Bahala Na strip. GastroPhobia: If this page of possibly-canon strips is to believed, then Philia is not an ancient Amazon, but actually an undercover Time Cop posing as an Amazon. Even better, she's Phobia's Kid from the Future, an Amazon and a Time Cop. Deep Time from Starslip serve both as a parody as well as a Deconstruction. Originally, they appear fairly uninvolved with the plot, only hunting rogue time travelers, but eventually they get into a jurisdictional dispute with the present over a time machine. This leads to a war in which the Future battles the Past, and Deep Time can't do anything without erasing their own existence, while mankind's present's government tries to beat them by banning time travel research, but continue it in secret anyway, leading to Deep Time's existence. Eventually, they erase the entire timeline and start over to ensure their own existence comes to pass, though the past would have won for want of a spork. The Time Line Authority in TRU Life Adventures. Times Like This: Agent Keith Scott is a one-man Time Police, keeping Cassie and her friends out of temporal trouble. In a brief arc in The League Of Super Redundant Heroes, a guy with the ability to teleport uses his power to pretend to be from the future and scare people into stopping what their doing. His pranks finally stop when his intended target is a real undercover Time Policeman who arrests him for "conspiracy to commit severe continuity disruption". The Thrilling Adventure Hour gives us two versions of this with "Amelia Earhart Fearless Flyer" and "The Cross-Time Adventures of Colonel Tick-Tock." Amelia flies through time trying to stop time traveling Nazis who want to Make Wrong What Once Went Right, while Colonel Tick-Tock does the same for more general threats to the timeline by the order of Queen Victoria. Time Squad is about a time cop, his robot servant, and an orphan history expert who venture throughout history to keep time continuity straight. Examples include forcing Ludwig van Beethoven to give up his Professional Wrestling career to resume composing, and getting the pirate Blackbeard to trade conservationism for buccaneering. Gadget Boy's Adventures in History. Uncle Grandpa episode "1992 Called" sees the main character call in the Time Police (named as such) himself to resolve an otherwise untenable situation with Christopher Columbus refusing to return a pair of time-displaced parachute pants. One episode of Dr. Zitbag's Transylvania Pet Shop involved the Time Police. Futurama had the Vice Presidential Action Rangers in the What If? episode, a "group of top nerds" tasked, by the U.S. constitution, to protect the space time continuum from disruptions. It consisted of Al Gore, Stephen Hawking, Nichelle Nicols, Gary Gygax, and Deep Blue. Fry lampshades the odd assortment. Fry: I thought your job was to cast the tie-breaking vote in the Senate. Al Gore: And protecting the time-space continuum. Read your constitution. On Time Warp Trio time travelers are responsible for making sure other time travelers like the series Big Bad don't screw up history. It's mostly informal, but they have Time Agents posted at certain at risk times/places, and they do travel back specifically to stop him at least a few times. Gravity Falls has Blendin Blandin, who was sent to fix temporal anomalies, and is thus more of a Time Mechanic. When his appearance actually causes those anomalies, actual Time Cops show up to arrest him. Milo Murphy's Law has the Bureau of Time Travel, whose main focus seems to be using time travel to improve the future while preserving the timeline, such as sending agents back in time to find a cure for the common cold or prevent the extinction of pistachios. While there is a group called the Time Police in Superjail!, they don't do anything that fits this trope. The Warden's "time-crimes" are not related to time-travel at all, and instead are from him making a decision that would snowball into Superjail waging war on the rest of the world, destroying the planet's ecosystem and enslaving all of the Earth's population that don't die trying to fight him.